The first book in this series was easily a 5 star read for me. At nearly 500 pages, I almost didn’t request it because of the length – but it didn’t feel that long when reading it. 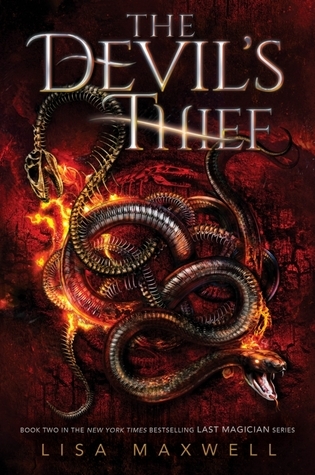 At 700 pages, I didn’t hesitate to request The Devil’s Thief because of how engrossing the first book was, but this novel felt like a chore at times, and the series still isn’t complete. With the third book (I’m assuming it will be the last? ), the series will be considerably even longer than Stephen King’s uncut version of The Stand. The dual timeline is compelling, and not at all confusing. I liked seeing how events in the past influence the present, and the changes in some of the characters over that time period. I gasped at a couple of surprising twists, and the world-building remains top notch. Characterization is also strong, and I enjoyed spending time with these characters again. However – Esta and Harte are disappointing. The majority of their story focuses on the romantic drama/tension between them, and does nothing to advance the plot. Viola and Jianyu have the more interesting plot developments by far, and Julian is a nice addition to the lineup. There’s also a good amount of repetition, but this was an ARC, and final editing may take care of that and lower the word count. Although this book underwhelmed me and didn’t move as quickly as the first, I’m curious to see where the next book goes, and I want to know the fate of these characters. The Devil’s Thief is scheduled for publication October 9th, 2018. This sounds like an interesting fantasy novel, Teri. It is quite long. It sure is, Robbie. With the length, I was sure it would be a duology, but there story is far from complete. Sorry to hear the shift in the focus diminished your enjoyment of the story. It was disappointing that the two main characters weren’t the most fascinating part of the story, but the supporting characters made up for most of it. since i have the last magician in my soon tbr, i apologize but i skipped your review. to be honest, i didn’t even read the synopsis for fear of spoilers. No worries, Jina – I never give spoilers in my reviews, but don’t blame you a bit. I’ve done the same thing! I never picked up the first book, but it’s one that’s always had me curious. They’re long, as you can see above, and the covers are gorgeous. I enjoyed the first better than the second, but would still recommend this series. Fantastic world-building and character development.